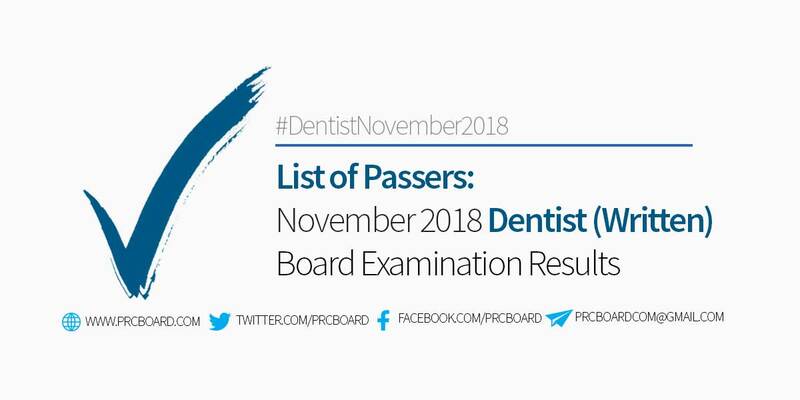 MANILA, Philippines – The Dentist board exam results November 2018 as well as the complete list of passers, top 10 examinees, top performing schools, performance of schools and related announcements will be available at this website as soon as PRC officially releases the results three (3) working days after the exams. The licensure exams (written phase) are administered by PRC Board of Dentistry headed by the Officer-In-Charge, Dr. Roberto M. Tajonera and its members, Dr. Rannier F. Reyes, Dr. Melinda L. Garcia, Dr. Gloria M. Bumanlag and Dr. Maria Jona D. Godoy on November 28-30, 2018 at PRC testing center in Manila. According to the Commission’s Resolution No. 2017-1068 entitled "Schedule of Licensure Examination for Year 2018", the target release date of November 2018 Dentistry board exam result will be on December 5, 2018 (Wednesday) or three (3) working days after the board exams. However, PRC may also release the official results earlier or later than the stipulated date without prior notice. During May 2018 exams, results were out after two (2) working days. Dentistry board exam is one of the programs with average number of examinees being administered by the Professional Regulation Commission. In the most recent exams conducted on May 2018, 509 out of 1,117 examinees passed the exams. The first three (3) spots all came from Central Escolar University in Manila. Claire Aguiba Guerrero ranked first having 85.54%, Fernan Rey Anthony Algas Arenas having 84.06%, Marie Therese Cheong Teehankee garnering 83.30%. Meanwhile, none among the schools qualified in the top performing schools list. To receive up-to-date news about November 2018 Dentist board exam results (written), we advise our visitors to bookmark this page, visit PRC official website or follow us at our social media pages via Facebook and Twitter.